If you've read even a few of my entries, you know that I love Google. I use it all day every day. I can't say enough how much I love it. About 2 years ago, I learned about Google's Applied Digital Skills program. Another incredible program from Google!! 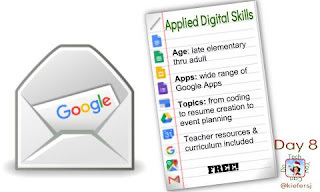 Here's my summary - as a teacher, you are given a Google account, as are your students. Google Docs is fairly simple to get up and going with ... Slides, while more involved, still fairly simple. You get rolling with these two and you think you are flying high. Then you hear others talking about Google Calendar and then Google Sheets and don't forget about creating your own Site!?! The list goes on and on. How do you incorporate all of these? How do you teach your students when you don't know these apps yourself? Introducing ...... 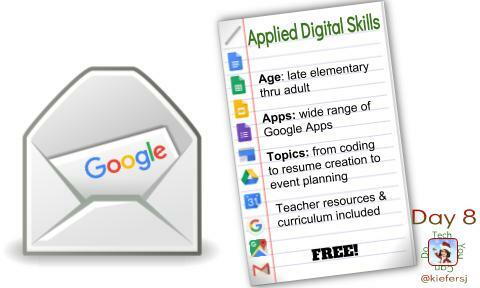 Applied Digital Skills!!! The website is very teacher friendly. Click on the teacher tab and you are provided the steps to get started. The curriculum tab allows you to search their ever growing collection of projects by Audience (the "who" you'd do the project with); Apps (the Google application you want to dig in to or cover); and/or Topics (the skills you are wanting to cover). Please don't limit your thinking that you have to be tech teacher to utilize this curriculum. There is no limit on the content areas that can benefit. And even though Google deems their youngest audience to be late elementary, don't feel like younger elementary "can't". It will take a bit more work and some modification of expectations, but it CAN be done with younger students. Another winner from Google! Check it out today.